NEW YORK, NY--(Marketwired - Jan 21, 2014) - World Moto, Inc. (OTCBB: FARE) (OTCQB: FARE) (BERLIN: WM7) (BERLIN: A1J8SY) ("World Moto" or the "Company") is pleased to announce today that the Mexican Patent Office (IMPI) has issued an official communication that the Company's Moto-Meter™ patent has successfully overcome the formal examination stage. Changing the way the world goes around, World Moto is a global authority on the $500 billion dollar a year motorcycle taxi industry and inventor of the Moto-Meter™, Wheelies™, and Yes™. 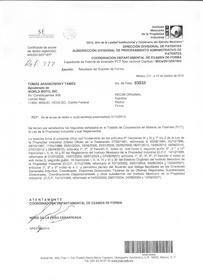 On Jan 10, 2014, the Instituto Mexicano de la Propiedad Industrial (IMPI), or the Mexican Patent Office, issued an official communication informing World Moto that its Moto-Meter™ patent had met all requirements for patentability and successfully overcome the formal examination stage for issuing a patent. The application is now awaiting publishing in the IMPI's Official Gazette, and the formal patent will be issued thereafter. World Moto has filed for patent prosecution of its Moto-Meter™ technology in 61 countries throughout Asia, Africa, Europe and the Americas. These countries were carefully selected to cover the vast majority of the world's moto-taxi and auto-rickshaw fleets and population. Nigeria was the first locality to complete its investigations and issue a patent, and now Mexico has also officially signaled its intention to issue the patent as filed, with no changes required on any of its 28 claims. The remaining 59 countries are currently in the substantive evaluation period and are expected to complete their investigations within the next 4 years. Based on its success in Nigeria and Mexico, and its original favorable review from the Patent Cooperation Treaty Examiner, the Company expects ultimately to be awarded a patent in every targeted jurisdiction. Mexico is a neighbor to the United States, and represents a strategic market for World Moto in North America, not only from the taxi drivers but also from the brand recognition that will propagate to the US. Hundreds of thousands of people cross the border between the USA and Mexico every day, with the border between San Ysidro, California and Tijuana representing the busiest land border crossing in the world. It is estimated there are as many as 1 million motorcycle taxis in Mexico, where they operate in a variety of configurations and are known as motoconchos. About Mexico: Mexico, officially the United Mexican States, is the 11th largest country in the world by population, and the 14th largest by land area. In total, about 79% of its population lives in urban areas, and only 21% live in rural areas. Out of the country's population of more than 117 million people, more than 21.2 million live in Mexico City, or the Federal District. This makes it the most populous metropolitan area in the Western Hemisphere, and motoconchos represent an integral part of the city's essential mobility. Note that the World Bank estimates that the numbers of motorcycle taxis will increase by more than 50% over the next five years. Also note that saturation of the Moto-Meter™ is projected to reach 100% within three years of introduction in any given market and that its life expectancy/repurchase cycle is estimated at three years. Market estimates do not include potential revenue from the Company's other products and services, such as the Wheelies™, Yes™, mobile commerce, advertising, accessories, servicing, calibration and all associated offerings. World Moto CTO Chris Ziomkowski stated, "This action by IMPI further validates the innovative nature of our Moto-Meter™ technology. World Moto's patent domain will now consist of countries in North America and Africa, and we expect additional patent issuances in 2014 which will further increase the value and strength of our patent estate." World Moto CEO Paul Giles stated, "The economic value of our Moto-Meter™ patent is enormous. In Mexico and Nigeria alone, it could generate over US$2.5 billion for the Company during the lifetime of the patent, and this will increase with each country approving our application." Copy of the Mexican Patent Office official communication is attached to this release and posted on World Moto's Facebook page, linked below. World Moto, Inc. is the global authority on the $500 billion a year motorcycle taxi industry and creator of the Moto-Meter™, Wheelies™, and Yes™. The Moto-Meter™ is a landmark device that CNN, Newsweek, Wired, Moneylife, among others, are calling "the world's first motorcycle taxi meter" and "world's first portable taxi meter" and "first-ever black box for motorcycles," while the Times named it "one of the most significant innovations of this decade" and Fast Company declared it "The First Real Taxi Meter Innovation in 100 Years...a $3 billion dollar idea." Wheelies™ display static and streaming media on the wheels of motorcycles and automobiles, providing a unique and beautiful new mobile medium for advertising, broadcasting, self expression and publishing. According to Fast Company, Wheelies™ "invents a new kind of screen -- and one that's potentially ubiquitous...It's best seen to be believed." Yes™ is a rapid retail and delivery service. Simply tap an app and get any local product, razors, diapers, toiletries, etc., delivered anywhere in less than 20 minutes. Launching in 2014, Yes™ will make brick and mortar local commerce as convenient as the Internet. The image is of a mototaxi or "motoconcho" in Mexico. The image shows that these "businesses-on-wheels" offer not only transportation from A to B, but a whole range of vital commerce services. Image: the Mexican Patent Office (IMPI) official communication that World Moto's Moto-Meter patent has successfully overcome the formal examination stage. Moto-Meter. First version with 14 segment LEDs. 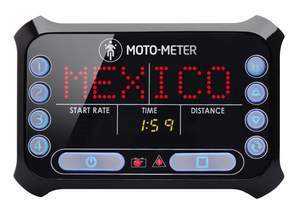 The revised Moto-Meter shown elsewhere with the text "Mexico" features dot matrix LEDs that can dynamically render graphics, icons, and multiple languages.